Retailers today face an opportunity to save millions of dollars a year, simply by fixing a structural flaw built into most retail supply chains. Large retailers have thousands of suppliers, each managing its own transportation to the exact same distribution centers. That’s an inefficient practice marked by redundant freight moves, high LTL costs and excess carbon emissions. The opportunity is for retailers to change ordering processes so they receive consolidated inbound shipments on a set schedule in fewer, fuller loads. 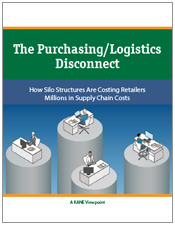 This KANE white paper looks at the purchasing logistics disconnect and potential solutions to streamline inbound logistics in the retail supply chain.